Question to Residents: Working on solutions to the curbside overflow trash cart problem. Curbside 64gal trash pickup is currently a free weekly service. The current best option for overflow is an additional trash cart at $100/yr. If the City lowered the cost of the 2nd trash cart to say $50/yr... would you opt for a 2nd cart to handle overflow? --- Overflow bags (Yellow City Bags) were discussed as messy looking, easily breakable, and cost ineffective for automated trucks. 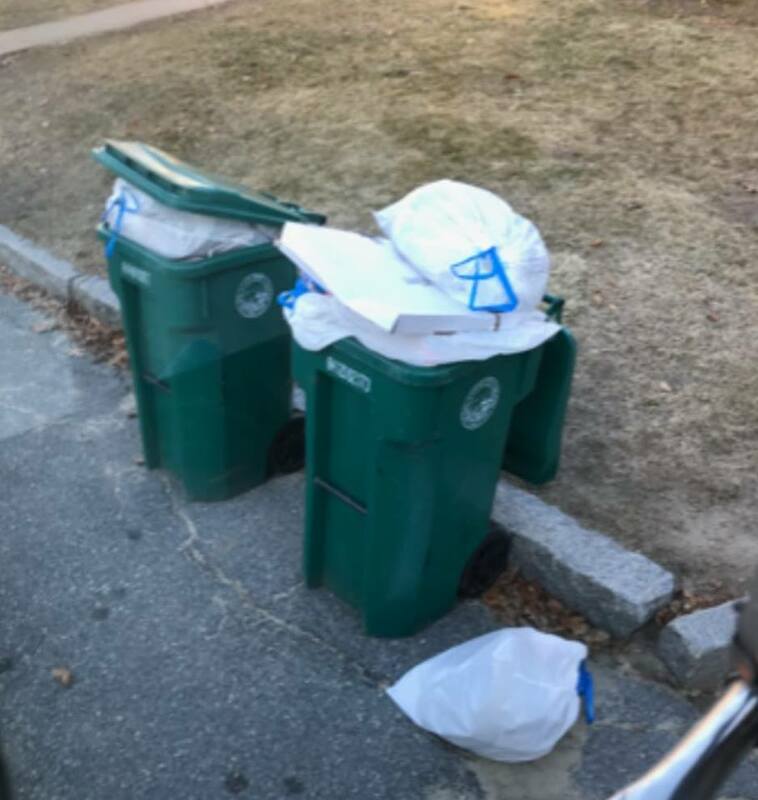 ---Fitchburg, MA offers Curbside 64gal trash pickup as a free weekly service & offers $100/yr for an additional 64gal trash cart for curbside pickup. ---Gardner, MA charges $200/yr. for Single Family/Apartment for trash carts and offers $3.50 overflow trash bags. ---Leominster, MA offers Curbside 64gal trash pickup as a free weekly service & offers $3.00 overflow trash bags. ---Westminster, MA has no municipal run curbside trash collection. Residents can bring trash to dispose at the Landfill at no charge. ---Lunenburg, MA charges per bag for curbside pickup. $1.25/13 gal, $2.55/33 gal, or $4.06/40 gal. ---Townsend, MA offers free curbside pickup of 64gal max trash bins and offers $3.50 overflow trash bags. ---Ashby has no municipal run curbside trash collection. Residents can bring trash to dispose at the ARCTS for $4.00 per 33 gal bag. ---Ashburnham has no municipal run curbside trash collection. Residents can must purchase stickers to place on their bags and bring to the Transfer Station at $5 per 32-35gal.